Black Holes + Wormholes = Quantum Answers : 13.7: Cosmos And Culture For 60 years researchers have been searching for a way to unite our separate understandings of the very large and the very small into a single coherent theory. Now a remarkable new idea is raising eyebrows, and hopes, around the world. Has the path to solve this problem just been found? An artist's impression shows the area around a supermassive black hole at the heart of the galaxy NGC 3783 in the southern constellation of Centaurus. Could a wormhole connect one black hole to another elsewhere in the Universe, creating an entangled pair? For 60 years researchers have been searching for a way to unite the very large and the very small into a single coherent theory. But for all their efforts, Einstein's Theory of General Relativity — which describes the Universe at large scales — simply won't play nice with quantum physics — the all-encompassing vision of the micro-world. But the appearance of a remarkable new idea is raising eyebrows, and hopes, around the world. Maybe, just maybe, a new clue to the most fundamental of fundamental theories has been found. Quantum mechanics was developed more than a century ago to explain the behavior of the atomic domain. Using their instruments to probe to ever-smaller scales, physicists 100 years ago found that the sub-atomic world behaves quite differently than our own. The list of quantum weirdness is long and includes things like intrinsic uncertainties and electrons existing in two places at once. One of the deepest mysteries of quantum physics, however, is called entanglement — the ability of two widely separated quantum systems to instantaneously affect each other. Make a measurement on one member of an "entangled" pair of electrons and its twin, stationed, perhaps, at the other side of Universe will instantly be forced to change its own behavior. Entanglement can't be used for "faster-than-light communication," so don't get any clever ideas. Still, the fact that quantum entanglement allows particles in widely separated regions of the Universe to remain intimately connected has pushed physicists to think about what it might mean for space and time at the deepest levels, i.e., quantum gravity. In the heart of a black hole the fabric of space-time, (the bread and butter of Einstein's General Relativity), must get broken up into discrete bits. We physicists believe this must be true because whenever we look closely at small enough scales we see Nature is broken up into tiny chunks (like grains of sand making up a beach). The problem with quantum gravity is that the smooth fabric of General Relativity's space-time just does not want to become "quantized." There was no easy way to make it break up into tiny bits (and, lets face it, tiny chunks of space and time is a pretty weird concept). In last decade or so some strong contenders have emerged for a theory of quantum gravity: String Theory and so-called "loop quantum gravity." Each idea has its promise and its challenges. But none can yet claim to be a fully working theory. There's a still lot of room for new ideas to pop up, both within and outside these frameworks. That's where entanglement comes into the picture. Back in 2009 physicist Mark Van Raamsdonk wrote a paper in which he took quantum entanglement seriously for Quantum Gravity. Van Raamsdook argued that entanglement wasn't just another wacky, unexplained, throw-your-hands-in-air quantum effect, but a clue to the fundamental structure of space and time. If you're a physicist, his essay held up one of those ideas that makes you stand back, stare into space and say "Yeah, that would be cool." You see, entanglement had mostly been the domain of folks studying foundations of ordinary quantum mechanics (photons and electrons), not quantum gravity. That's why Van Raamsdonk's essay made people stand up and take notice. This is also when black holes come into the picture. 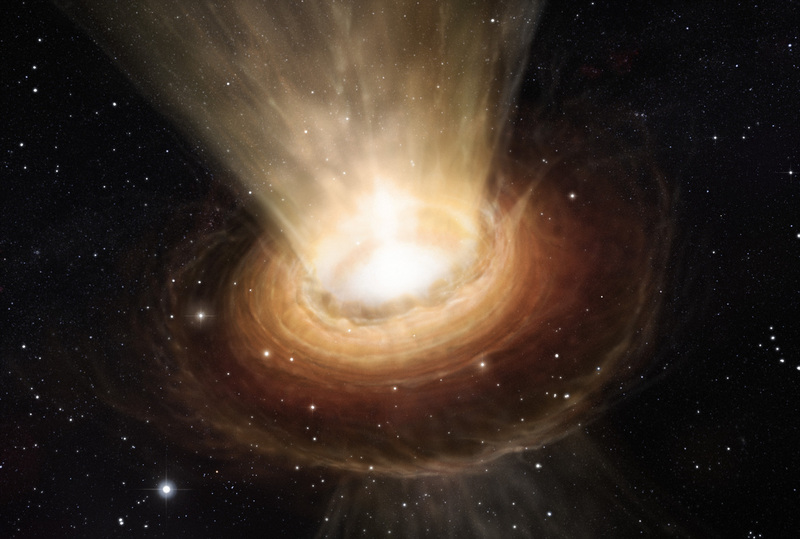 Building on Van Raamsdonk's ideas, theoretical physicists Juan Maldacena and Leonard Susskind recently published a paper entitled "Cool Horizons for Entangled Black Holes" (yes, that is actually the title). In their study, Maldacena and Susskind show how a pair of black holes could be created with a wormhole strung between them. For those of you not watching too many science fiction movies, a wormhole is a kind of tunnel in space-time that can quickly connect two widely separated regions of the Universe (they are formally called Einstein-Rosen bridges). That expression "widely separated regions of the Universe" is the key, since it also appeared in the explanation a few paragraphs ago of entanglement. What Maldacena and Susskind showed was that their black holes + wormhole system was also an entangled quantum system of space-time. With their calculations, the two physicists had explicitly made the link Van Raamsdonk's work implied. They put teeth on the connection between entanglement (an essentially quantum idea) and space-time (an essentially General Relativistic idea). Entangled black holes = black holes connected by a wormhole. That equation, if it holds true, may mean a new and fecund path to understanding the quantum underpinnings of space-time's flexible fabric. It's an idea that may be really, really important, or it may just be another dead end (quantum gravity has had a lot of those). It is impossible to say just yet which one of those outcomes will turn out to be true. In the meantime, there is no way of getting around how cool it is to think about this idea. And if it turns out to be the key to the first warp drive, just remember: you heard it here first!